Kelly Galea is a creative, multi-passionate entrepreneur and luminary blessed with a unique combination of wit, grit, intellect and intuition. She helps you navigate the work-life maze of ever-shifting priorities and transform your life through holistic self-discovery and immersive, fun, and magical mini-quests. Working with Kelly will inspire you to unveil, express and celebrate your vital personality and lifestyle preferences to create a more harmonious life. Kelly’s adept at wearing many hats, is bilingual in left- and right-brain thinking, and radiates positivity. A lifelong learner, she holds degrees in Marketing Management and Computer & Information Sciences from the University of Michigan. Additional areas of study include photographic arts, interior design, color theory, feng shui, and natural healing. 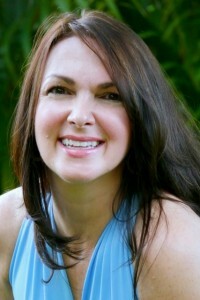 She is a certified Dewey Color instructor and consultant, Reiki practitioner, and certified Angel Card Reader. Graced with spiritual gifts since childhood, Kelly embraces her role as an intuitive guide and crusader for creative expression and shares her perspective in the podcast, “Through the Kaleidoscope,” helping women find soul-satisfying solutions and synchronicity in life and business. Before she escaped the 9 to 5 grind, Kelly spent nearly 20 years in corporate America, working for and consulting with Fortune 500 companies in a variety of roles including project management, business analysis and design, marketing and operations, research, technology and web development. Itching for a more creative outlet for her talents, she took entrepreneurial leaps with side gigs in photography, professional organizing and interior decor, which led to her becoming principal and partner of an interior design firm. Knowing there was something more she was meant to do, she launched Trinity Creative Partners to provide inspiration and solutions to small businesses, entrepreneurs and professionals in transition. As a lifestyle designer, business consultant, author and speaker, Kelly blends her unique strategic and creative talents to help you spot and set in motion small shifts for big results (so you can get your shift together, too)! She’s made about every business and personal mistake in the book so you can avoid doing the same! 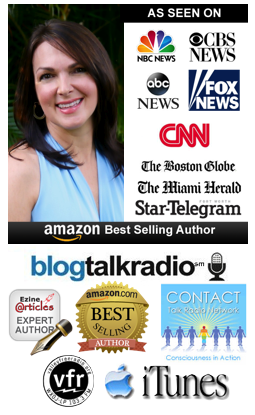 Hi, I’m Kelly, former corporate hostage turned multi-passionate creative entrepreneur! My expertise as an intuitive guide is understanding your passions, talents and skills and looking at how you can best put them to use in your reimagined life and business. I provide you with the guidance and support you need to create a more vibrant life, worthy of the fun, smart, spirited, and adventurous soul you are! I have a knack for grasping complex topics, boiling them down, keeping it simple. I’m an information junkie, so you don’t have to be! I help you pull all the pieces together and make it work. I provide the support you need when choosing to make a career or life change so you can move forward quickly. Still here?? Maybe you're an info junkie, too ... or you just like a good story & want to know even more about my journey. If that describes you, read on! I wanted to design and create a life that would work for me, and a way to get it. I didn’t want to be stuck in a JOB, working away, in the hopes it would create the life I wanted. So let me tell you about my corporate to creative path. It wasn’t always pretty, and I can tell you plenty about what not to do! My path took many twists & turns as I initially pursued mechanical engineering, then found an interest in marketing & market research, then answered the calls of tempting salaries in information technology, management and consulting. Early on I was excited and easily enticed by bigger opportunities, better titles and larger paychecks. Then I found myself becoming increasingly frustrated - I had so much more to offer. My team had more to offer. People were in positions they didn’t like while over there was a position they would be perfect for, but it was being filled by someone who didn’t like what THEY were doing! Companies created different leadership and technical tracks that just didn’t work. Employees were skeptical, while managers continued on with a business-as-usual approach. This wasn’t within just one division in one company, this was a common occurrence. During my nearly 20 years in Corporate America, I worked in many different positions for almost as many different companies, the majority of which were Fortune 100 and 500 companies. I was a marketing analyst, market research analyst, computer programmer, systems analyst, business analyst, team lead, manager, and producer. Yes, I bounced around a bit. I was looking for something more, for a better fit. I wanted a job where I would be encouraged to explore my creativity and passion. I wanted to be paid well doing something I liked and felt was fun and fulfilling. I’m not saying such jobs don’t exist, but for me it was a clear indication that I needed to make a change, and going after another position at yet another company wasn’t the answer. 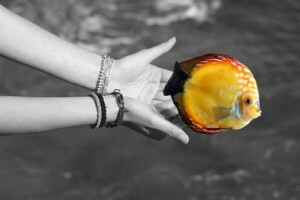 I knew I needed to break free of my corporate life, yet I continued to hold out hope and remained stuck. What kept me there so long? Many things - the money, the benefits, the familiarity with and comfort of what I knew, had experience with and was educated in. Knowing my family and friends would think I was crazy if I were to leave the so-called security of a good job with a well-known company. But something kept building up, there was a call I wasn’t answering, and when that happens it shows up some other way in your life. For me, it showed up in my health & relationships. I felt completely adrift in rough seas. I was hoping to ride out the storm, but I was anchored by my corporate job and it was pulling me under. I made a decision. 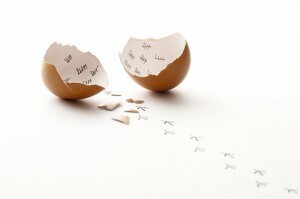 At the encouragement of a friend / mentor who could clearly see what was going on, I decided to leave Corporate America and began to hatch my escape plan. I knew I wanted to do something creative, but wasn’t quite sure what. Ultimately, that didn’t matter. My friend insisted I set a date for leaving the corporate world behind and start working on a plan. So that’s what I did! And I’m happy to say I left within a week of that original date, and the last project I delivered in my corporate job came in on time and under budget! Before I left, I’d been taking design classes and was doing some work on the side with a friend who was an interior designer. After an apprenticeship, I combined my passions for design and business, becoming partner of an interior design firm. And let me tell you, although I had a lot to bring to the table with my experience in business, project management, analysis, technology and design, I learned a ton - not only about design, but about people, business and about myself. It was a pretty painful transition. I was incredibly excited about my new venture, and equally overwhelmed by all there was to do. I was full of ideas, initiated many projects and experienced great successes ... and made more than my fair share of bad decisions and costly mistakes. I learned the hard way. While I owned the design firm, I regularly met with other interior designers to talk about the business of design. These are the professionals I am eternally grateful to for the next interesting twist in my creative path. 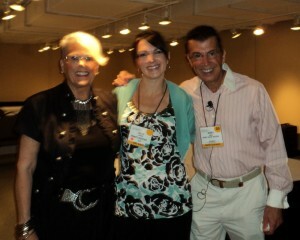 They are the ones who planted the seed (in 2008) for my coaching and consulting business. My passions and strengths are in helping creative entrepreneurs and business owners CREATE .... create the lives and businesses they really want. I hear all the time that I have a calming effect on people, that I make them feel better. They feel optimistic and hopeful. They feel it’s possible to create the business and life they want. And you know what? It is! So what makes me tick? And why am I so drawn to this particular mission? 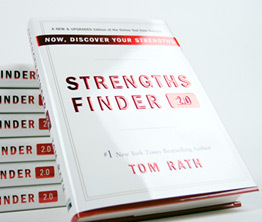 Rather than tell you myself, I thought I’d share some insights from a couple sources I highly recommend to help reveal your magnificent strengths and remarkable gifts. I will always have a passion for design and continue to stay current on trends. I’m particularly drawn to color, and helping others understand how color preferences impact their lives, which is why I became a Dewey Color Instructor teaching color consultants. The Anchors: You have fun nurturing and supporting others. Your endless curiosity entices them to tell you what they are thinking. You see people’s dreams and are sensitive to their needs. You give them the self-confidence to believe in their own capabilities. Your concerns make them feel important. Your listening grounds them. You give the gift of knowledge. Your suggestions make others slow down & consider all the options. Your objectivity gives you and others the ability to consider things thoroughly. When you get what you wish, your hope is renewed. You bring optimistic agendas and problem-solving skills to situations. There was a point in time when I really wanted to get a tattoo, but I couldn’t decide on what to get. Then I came across this symbol. I was immediately drawn to it so started doing some research on the meaning. A positive number representing expansion, expression, synthesis, communication, openness, creativity versatility, optimism, birth and growth. As a general overview, the number 3 represents the unity of opposing and dualistic principles and the fulfilment of a self-contained entirety. Represents mind, body, and spirit; faith, hope, and love. An ancient symbol that represents the trinity of birth, death and rebirth; the progression of life. Representational of the shape changing self. 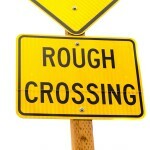 Sign associated with migrations and independent movements. Centered around the concept of several returns or homecomings. 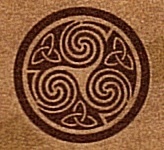 An old symbol for potential power, spiritual wholeness. In the psychology of dream symbols, can represent the resolution of conflict, new solutions, a new life direction and healthily flowing life energy. Bingo! Fortunately, I couldn’t quite settle on where to put the indelible mark. So when I began forming my current business, I knew immediately our company name and branding would reflect these meanings and include this symbol. 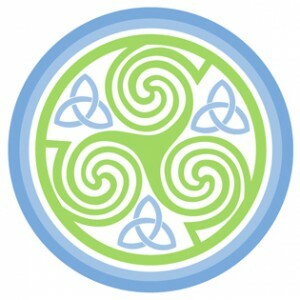 The triskele made its indelible impression on Trinity Creative Partners, without leaving any permanent ink marks on me! Watching my favorite college football team, the Michigan Wolverines, of course! 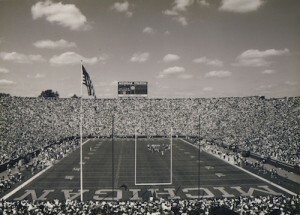 The Big House at The University of Michigan. Always enjoy a visit to my alma mater! Sure, as a state it’s an easy target for jokes. But so is Michigan, California, Missouri (some of the other places I’ve lived) and .... And yes, it’s hot & humid but I’ve also seen it snow here and have felt a damp, finger & toe-numbing cold I’ve never experienced anywhere else. And yes, we have lots of snowbirds and tourists, and our local businesses thank them very much. All kidding aside, I’ve known since my first family vacation to Florida that I was meant to live here. It all felt so familiar as if I’d been here before. 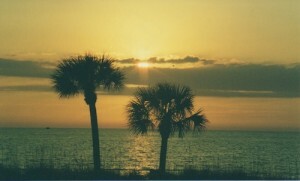 I love the sun, sand and surf and have my sights set on the coast. Somewhere west and south ... it’s too cold for me here in Orlando! 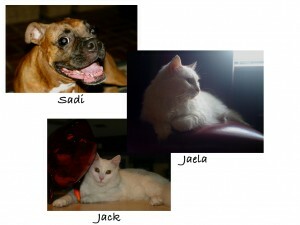 I’m a mom to furry, 4-legged, perfectly spoiled & loving animals. Here's a photo of our beloved Sadi, a brindle Boxer who will always be in our hearts; Jaela, diva & likely Norwegian Forest kitty; Jack, Jaela’s sweet & simple son. I’m also a wife, step-mom, daughter, sister, and niece. 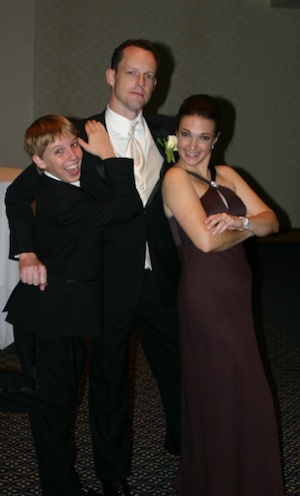 Here’s one of my favorite photos of my family, taken at my sister’s wedding (2007). Meet Dylan, supremely witty and blessed with impeccable comedic timing and skill. And next is Brendan, a true partner in life, a loving and calming presence, and the kindest, most caring and generous person I know. I am so grateful for my family and friends, who are overwhelmingly supportive of my latest venture in life. One of my favorite ways to share time is our (nearly) weekly dinner with our Neighbor Dinner group and activities with our network of friends and family. We first began our Neighbor Dinner in September 2008.